Environmental campaigners have been staging protests against the expansion of Heathrow Airport, one of the world's busiest airports. They say any growth in the aviation industry will undermine efforts to tackle climate change. Why are commercial flights being targeted by environmental campaigners? Since the emergence of low-budget airlines in the 1990s, the number of people choosing to take flights has seen a rapid increase. In 1992, 108 million passengers passed through UK airports. By 2002, this had increased to 190 million passengers. 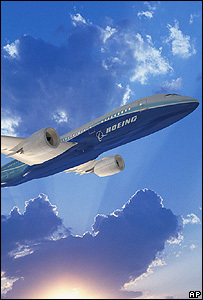 Boeing, the aircraft manufacturer, expects the global commercial fleet to more than double to 36,000 by 2025. Campaigners say this growth is unsustainable and will not only have a huge impact on carbon emissions, but will also lead to local noise and air pollution and see airport expansion over greenfield sites. However, not everyone shares this view. A recent report by the British Airline Pilots' Association (Balpa) said aircraft were minor polluters in comparison to other forms of transport. Currently, commercial flights account for about 3% of the EU's total greenhouse gas emissions. Why is there such a fuss if emissions from aviation make up only a small percentage greenhouse gas emissions? While other sectors, such as electricity generation, are stabilising or reducing their emissions, the transport sector's greenhouse gas emissions continue to increase. Emissions from the international air transport sector within the EU are increasing faster than any other mode, says the European Commission. Although aviation currently only accounts for about 3% of the EU's total greenhouse gas emissions, the sector has seen an 87% increase in CO2 since 1990. This rise has been blamed on the emergence of cheap air travel. In the UK, flights are responsible for an estimated 7% of the nation's carbon emissions. But this is projected to increase to as much as 25% over the coming decades. Research also shows that emissions from aircraft have a greater impact than those originating from sources on the ground. Studies carried out by the International Panel on Climate Change (IPCC) suggested that, at high altitudes, the aerosols in the exhaust of jet engines had a range of additional impacts. The IPCC reported that as well as the associated CO2 emissions, condensation trails (contrails) and aerosols from aircrafts' exhausts had the potential to alter cloud properties and deplete ozone in the stratosphere. As a result, aircraft emissions are said to have between two to four times the global warming potential as ground-level CO2. Why not just offset the emissions? At the moment, greenhouse gas emissions from international commercial flights are not subject to any limits. For example, they are not included in the Kyoto Protocol. This means there is no legal obligation to curb emissions from aircraft. However, most of the leading airlines offer passengers the chance to offset the carbon emissions from their flights. But a recent report by UK MPs expressed disappointment, saying the voluntary schemes were "unsatisfactory". The Environmental Audit Committee concluded that the aviation industry had a "diverse and generally unsatisfactory attitude towards offsetting". It also criticised airline companies for not taking part in a recent consultation by the UK government. The MPs said this was because the companies did not want to draw attention to the "malign effects of air travel on the environment". 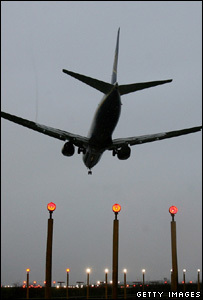 Airline bosses have expressed a desire to reduce the environmental impact of flying. A number of initiatives have been announced, such as supporting research into more fuel-efficient aircraft. They are also generally supportive of becoming part of the EU's Emissions Trading Scheme (ETS). The European Commission has announced that the ETS will cover commercial flights within the EU from 2011, and all flights to and from the EU in 2012. What can be done to reduce the environmental impact of the airline industry? Campaigners want people to take fewer flights, and only fly when no alternative is available. They say this will reduce the number of flights and, in turn, stop further expansion of airports. But airline chiefs say they are taking their responsibility to the environment seriously. Giovanni Bisignani, director-general of the International Air Transport Association (Iata), said aircraft noise had been reduced by 75% over the past 30 years and fuel efficiency had increased by 70% in the last four decades. However, he admitted that the industry's growing carbon footprint was not "politically acceptable". Aircraft are likely to remain dependent on fossil fuels for the foreseeable future, although the likes of Virgin boss, Sir Richard Branson, have said they will invest heavily in developing aviation biofuels. Another alternative fuel is hydrogen, but aircraft able to run on this fuel are still little more than a conceptual idea at the moment. Improving aircrafts' aerodynamics and reducing their weight is one area that is receiving serious attention. This could result in future fleets being 40-50% more efficient than current designs. Both Boeing and Airbus say their latest models are more fuel efficient than existing models. Airbus' A-380 will be able to carry more passengers, reducing the amount of CO2 per passenger mile. Boeing's 787 is made out of lightweight composite materials and could be 20% more efficient than the heavier aircraft it will replace. Another way to reduce emissions could be through the way air traffic is managed. For example, reducing taxi-times, slower flying speeds, and more direct routes could all help reduce fuel consumption. But it is unlikely these measures will halt the overall increase in the industry's greenhouse gas emissions if more people continue to take more flights.